From 26 to 29 July 2018, His Beatitude Patriarch of Alexandria and all Africa, Theodore & Iota; & Iota; was in Moscow on the occasion of the celebration in honor of the 1030th anniversary of the Baptism of Rus. For accommodation was chosen hotel & la Pokrovskaya & raquo; at the Pokrovsky Stauropegial Convent. 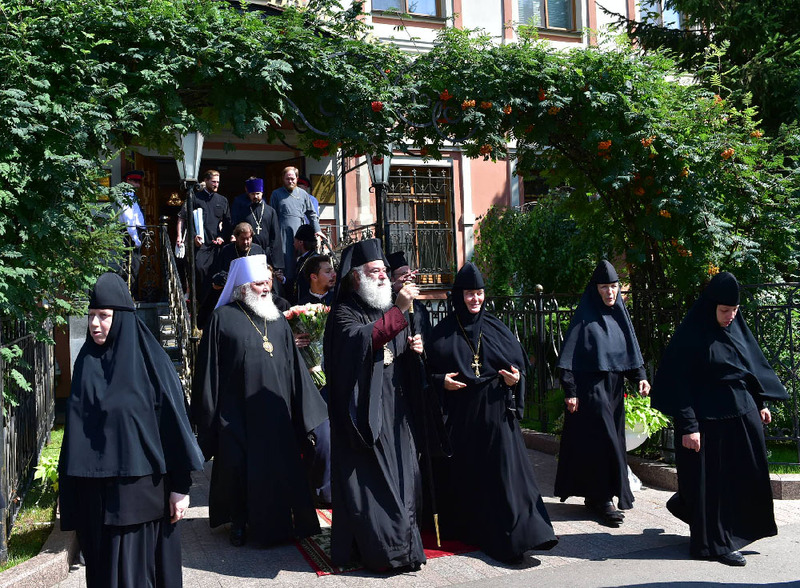 The delegation accompanying His Beatitude Patriarch Theodore includes Metropolitan of Damascus Johannesburg and Archimandrite Daniel (Biasis). Also, representatives of the Jerusalem, Georgian, Cypriot, Serbian, Albanian, Polish and Bulgarian Orthodox churches completed their visit to the Intercession monastery. The primate and representatives of the Local Churches were met by Abbess Theophania with his sisters, clergy of the monastery, employees of the hotel and children of the orphanage. His Holiness the Lord and his entourage as well as members of the delegations went to the Intercession Church where they bowed to the relics of the holy Blessed Matrona of Moscow. As a gift to His Beatitude Patriarch Theodore II, the Abbess Theophania presented the icon of the holy, righteous, blessed Matrona of Moscow and the censer. His Beatitude Patriarch Alexandria of Theodore II also presented Mother of Hegumen with memorable gifts. Then the Abbess Theophania held a brief excursion for the guests with a story about the history of the monastery, in the end the guests were offered a monastic meal.